Norman looks down at the gift for a long time, thinking. "So ... you didn't want the little candles. You made me get you big candles. So you can use them to make candles. 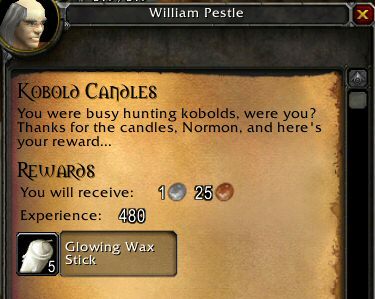 And now you're paying me in candles? ", Norman asks. "It's a glowing wax stick!" Pestle corrects him. "That's what a candle is! ", Norman shouts. "I can't even... I don't even know which one of us just got screwed here. This is just so..."
"Don't worry big guy," I tell him. "It was you." Finally we return to Marshal Dughan. "The Fargodeep mine is overrun with Kobolds," Norman says flatly. "Duh," I add under my breath. 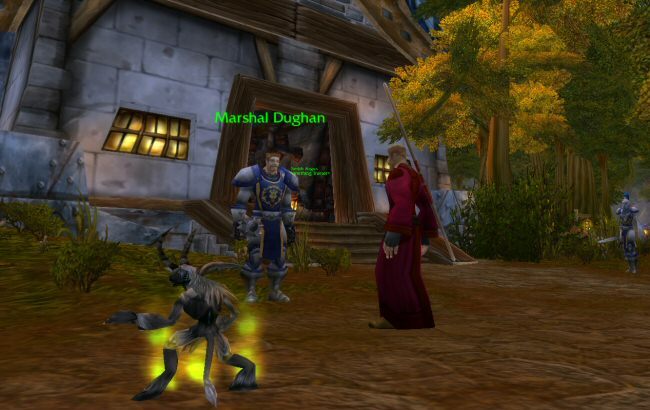 Dughan's face wears the shock of a man who has just woken up with a Tauren prostitute in his bed. "What's next? ", he exclaims, "DRAGONS? I guess I'll have to increase patrols in that area." He fishes a couple of sweaty silver coins out of his armor and hands them over. "You have patrols?" Norman asks with surprise, "Because I never see you guys outside of town." "Oh, not that kind of patrol," Dughan says with a deep laugh. "You won't catch any of us wasting our time in the wilderness." 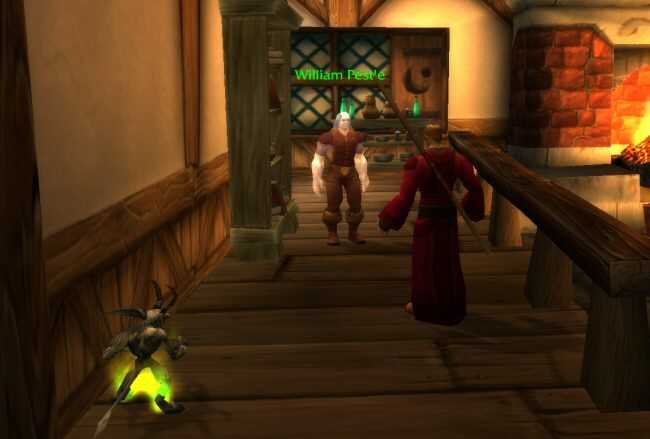 "So what kind of patrols do you have?" Norman asks this with a certain degree of fear in his voice. "Oh, every once in a while we'll get some idiot townie to go out and poke around in the woods for us. If they come back in one piece we give them a couple of silver or something." I glance up, and it looks like Norman is trying to eat his own mustache. "Oh! That reminds me," Dughan says suddenly. "I need you to travel east to the Jasperlode Mine and check it out." Next Week: THE END IS NIGH!